Apple iPhone 8 Plus was launched in September 2017. The phone has a 5.5-inches bezel-less Retina HD True Tone IPS LCD display with a resolution of 1920 x 1080 pixels, having 401 ppi. It is run by Apple’s A11 Bionic chip with 64-bit architecture and an embedded M11 motion coprocessor. Apple iPhone 8 Plus dimensions are 158.4 x 78.1 x 7.5 mm, and it weighs 202 grams. It comes with iOS 11. Apple iPhone 8 Plus has a dual rear camera of 12 MP (wide-angle) + 12 MP (telephoto), while the front camera is 7 MP. The wide-angle camera comes with ƒ/1.8 aperture, while the telephoto lens gets f/2.8 aperture. Other features include optical zoom, digital zoom up to 10x, Quad-LED True Tone flash, Portrait mode, and Portrait Lighting. It is capable of shooting 4K videos at 24fps, 30fps,or 60 fps, 1080P videos at 30fps or 60fps and 720p videos at 30fps. There’s support for slo-mo videos for 1080p at 120fps or 240fps. The front camera, which is 7 MP, has a f/2.2 aperture and Retina flash. Other features include 1080p HD video recording, Backside illumination sensor, Auto HDR, and auto image stabilisation. The storage options available are of 64GB and 256GB. The battery in iPhone 8 Plus is said to offer up to 21 hours of talk time, and up to 13 hours of Internet use. Apple iPhone 8 Plus supports fast charging, claimed to provide up to 50 per cent charge in 30 minutes and wireless charging with Qi chargers. 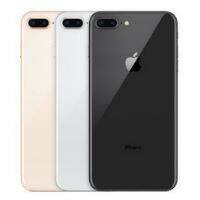 Apple iPhone 8 Plus comes with IP67 rating, which makes the splash, water, and dust resistant. The Apple iPhone 8 Plus provides various sensors like Touch ID fingerprint sensor, Barometer, Three-axis gyro, Accelerometer, Proximity sensor, and Ambient light sensor.